Somehow, it's been nearly two months and I still have ALL of my eyelashes! When I do manage to grow them back, they never stick around for this long and I'm so happy (and proud) that I've still managed to keep them all. 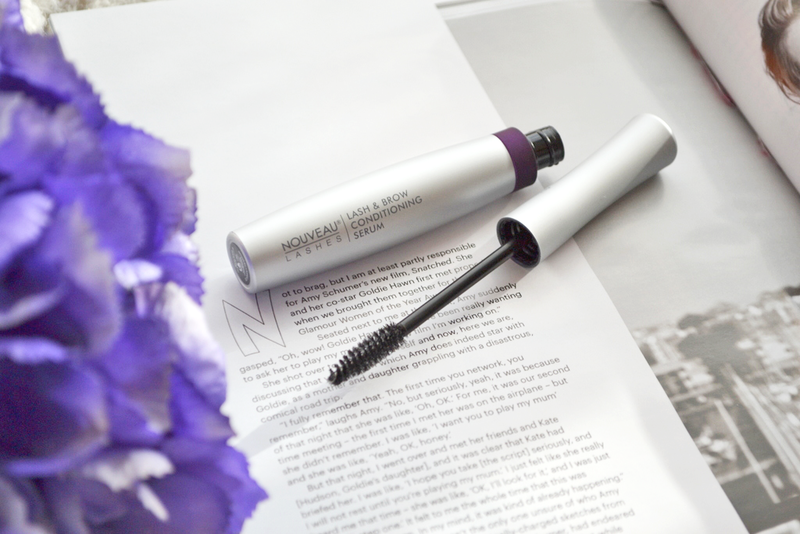 If you read this blog regularly, you'll probably know that I pretty much rely on RapidLash to help my lashes grow faster, and I swear it makes such an incredible difference to how quickly they do come through when they're at that stage where they are just starting to poke through. This time, I had just enough left to get them to grow through, but now my RapidLash tube is completely empty; I made sure I got every last bit out of it but it's definitely time to finally say goodbye! As soon as my lashes were at a length where I could wear mascara, I still wanted to apply some kind of serum to keep them strong and healthy, so started using this Nouveau Lashes one I had been sent to photograph for the brand a while ago but had never actually used due to the mascara wand. Turns out it's done a pretty good job! As I have just briefly mentioned, I don't think this serum is for you if you have no lashes at all. It's just impossible to apply because of the mascara wand; you need some lashes there to even use it in the first place. But, if you're at that stage of trich where they have started to come through but are still weak and brittle from the years of damage pulling does, then this could be a good little product for you. Mine were quite short and didn't have much volume; I remember having the most gorgeous, long luscious lashes when I was younger but doubt I'll ever get that again- damn trich! I started applying this serum every evening as part of my routine after taking off all my make-up. I don't know if anyone else with trichotillomania gets this, but when you have lashes, applying mascara is just the best feeling in the world. I kind of got that with this serum. Being able to brush the mascara wand through lashes that are actually my own feels amazing, but you're just applying serum rather than a jet-black formula! Perhaps this element adds to how much I'm enjoying this product. This serum can be used on both lashes and brows, however I have only tested it on eyelashes as my eyebrows are completely bald. After using this for the past 6-8 weeks, I have genuinely noticed such a difference in the condition of my lashes, compared to other times they have grown through in the past. They are stronger, more resilient, feel so much healthier and, whilst they're still slightly lacking in the volume department, having them in better condition has allowed them to grow a bit longer than usual (if they're brittle and weak they're more prone to falling out or breaking before they get to a good length). The mixture of multi-vitamins and 'conditioning actives' has, in my opinion, really helped to give my damaged lashes the little boost they needed. Don't expect this to make them grow through fast and give oodles of volume, because it won't. What it will do is just ensure they are kept in as good condition as they can be, which is often much-needed with trichotillomania. The serum is gentle, cruelty free and vegan too (just an FYI) and costs £19.99 (which isn't too bad for a lash serum!). Do you have a lash/brow serum that you always use? Which other ones would you recommend?